Have you ever had a person come up to you, gently raise their arm towards your midsection and sweetly ask, ‘Aw, when are you due?’ If you’re actually pregnant, this might be a nice chance to gloat over your soon-to-be baby. If you’re not, well, you probably wanted to punch that gentle person in the face or crawl into a hole and cry. Or, maybe if you’re like me, you’d shyly fake a small smile and say, ‘three months!’… then find a hole to crawl into. Feeling bloated and uncomfortable is bad enough, but having others make you feel worse is never fun. I’ve written about style choices before and explained that there are ways to try to hide your non-existent baby-bump; however, I never really got into the nitty gritty of how it really feels to be in that position. 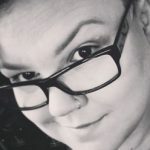 There are many people in this world that relate to feeling a little bit bloated, but when you’re in constant pain with an ever-expanding belly due to IBS, it’s an entirely different monster. Trying to fit into your clothes, or getting sick of wearing sweat pants twenty-four-seven can be detrimental to your mental well-being. Often, when bloating rears its ugly head we simply want to hide ourselves away and hope that we can return to normal. 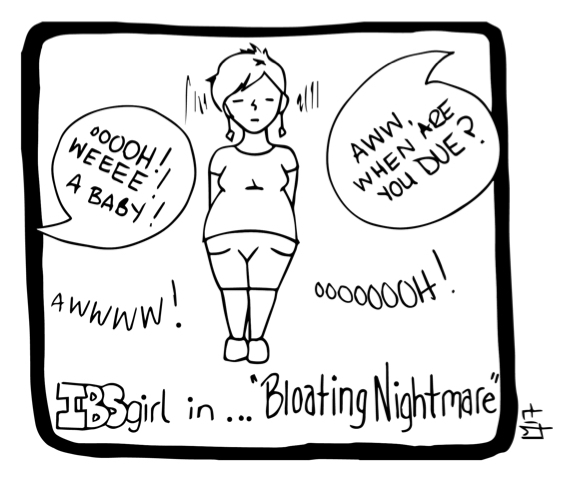 The problem is, of course, when you suffer from IBS bloating is just another part of life. Bloating is life. The important thing to remember, though, is that although you live with bloating you do not have to live for it. I know it is easier said than done but when you can, remember that comfy clothes don’t have to be ugly, that ignorance does not necessarily means malice, and whenever you can, please, try to find the humor in things. Because if we can’t laugh about our bloated bellies, it’s going to be a long, sad ride.